The Union earned their first point of the season, visiting a struggling Atlanta United without Marco Fabián but still getting a result. Local, Atlanta, and national coverage of the game. Not only did Brenden Aaronson make his first MLS appearance, but he also created and scored his first goal. The Union did not contest Marco Fabián’s red card suspension, but there will also be no further punishment beyond Sunday’s game. Expect the Mexican international to return to the lineup for next weekend’s home game vs. Columbus. Social media provides access to famous people in ways never seen before, but there is a downside to it as well. Fafà Picault received a disturbing message from a “fan” after Sunday’s game. Hopefully the deranged individual who wrote that finds help. The city has put together a website to publicize it’s campaign to be one of the host cities for the 2026 World Cup. 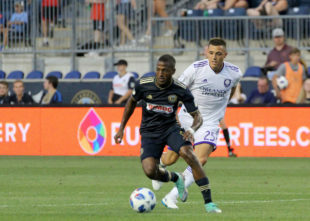 Bethlehem Steel FC had their “home” opener in Talen Energy Stadium, only to lose to North Carolina FC in a close 1-0 game. Double penalty save by Steel (and Union) keeper Carlos Miguel Coronel, though. FC Cincinnati beat the Portland Timbers 3-0, giving the Ohioans their first win in MLS, and making the Timbers the first team to ever give up three (or more) goals in the first three games of an MLS season. Toronto FC continued their CCL rebound, beating New England 3-2. Speaking of the Revolution, a recent arrest has brought more attention to the stark contrast between Robert Kraft’s success in football, and his complete lack of success in soccer. A still Zlatan-less Galaxy snuck past Minnesota United thanks to a late goal from Sebastian Lletget. Wayne Rooney got the hat trick, but as a whole DC just dominated RSL in their 5-0 victory. And in results that shouldn’t surprise anyone, Montreal beat Orlando, and the Red Bulls bested San Jose. DaMarcus Beasley is still going. Tim Ream, shutting down Mo Salah. DeAndre Yedlin, setting up Matt Ritchie. Florian Balogun, an up-and-comer at the Arsenal Academy, says he’s still undecided between playing for England, Nigeria, or the USA. Fabian Johnson became the second American to play over two hundred games in the Bundesliga. Though he’s got a ways to go if he’s going to catch Steve Cherundolo. With Steffen injured, Jesse Gonzalez has been added to the USMNT roster. Michael Ballack is worried about Germany. Construction is dangerous work, and any large scale project will have it’s cost. But at this point Qatar is beyond macabre. Will England finally admit they were too slow to accept VAR? Probably not. I believe Steel played at Talen (not travel to Cary, NC). But that double save by Coronel was pretty solid! Also interesting to seed a lot of academy kids already getting starts/appearances so early in the season. Usually the academy kids get more minutes towards the end of the season, hopefully that indicates they’re getting even better and earning minutes sooner. It has more to do with injuries I think. So can you play Montiero (new guy) at the 6, Bedoya and Aaronson as your outside part of the diamond, with Fabian at the tip? or could Bedoya be the 6 and Montiero and Aaronson be on the outside? I am just looking at a way to keep Aaronson on the field. He’ll never play another match. The next worst provided was 60 in the former workers’ paradise for the Sochi Olympics. That’s 500 times worse than the second worst recent example in the samples provided.